To create best conditions for people and processes, LTG Comfort Air Technology creates customised solutions that inspire: with efficient air-water Systems, attractive air diffusers and precise products for air distribution. 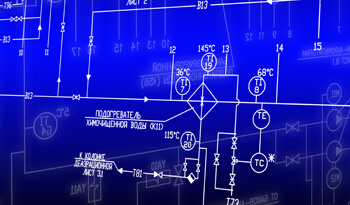 Click here for LTG innovations for building air conditioning. 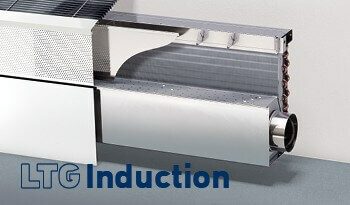 Induction units of the LTG Induction series feature many advantages, such as high cooling and heating capacities, low sound levels, long service life and low maintenance requirements. These induction units of the latest generation are extremely energy-efficient and can be operated under on-demand control thanks to LTG's SmartFlow technology – for even greater comfort and efficiency. 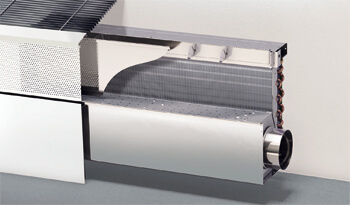 Fan coil units are classic products for air-conditioning. 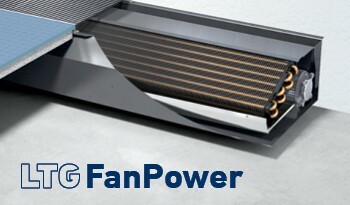 The LTG FanPower series uses tangential fans to achieve an optimum flow and acoustics for a range of installation situations. Thanks to the highly inductive impulse air flow LTG TransientFlow, we achieve an especially high comfort at best energy efficiency. 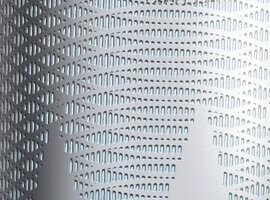 Decentralised facade ventilation units offer both architects and planners unique flexibility besides being highly economical. Both fresh air and return air are routed via the facade and processed – without a central unit or duct system. 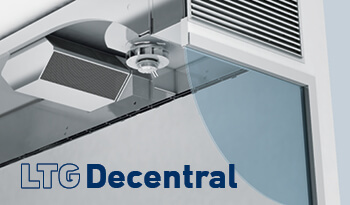 LTG Decentral decentralised ventilation units are available for all installation situations and offer innovative options for an individualised and on-demand air-conditioning system. With our System PulseVentilation we achieve an economical and comfortable transient air flow with one of the oldest concepts of the world: breathing. 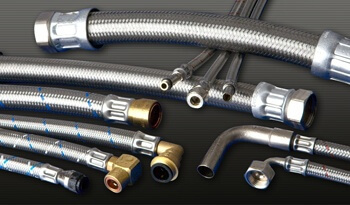 Our extensive range of specially matched accessories for air-water systems ranges from high-quality hoses and valves for water connections to dependable control systems. 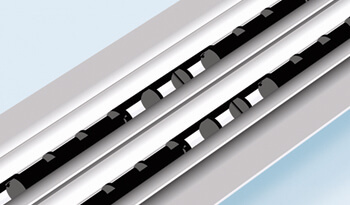 LTG linear air diffusers meet highest requirements of comfort, acoustics and design. 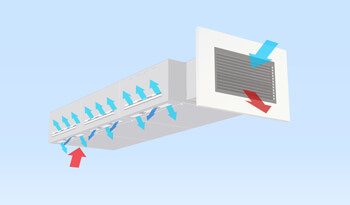 Linear diffusers for ceiling or wall Installation are equipped with the unique LTG System clean®, which prevents visible accumulation of airborne particles in the vicinity of the diffuser and reduces costs for renovation and maintenance considerably (optional). Thanks to LTG SystemDesign , linear air diffusers for floor installtion are available with the same design as other LTG floor devices. 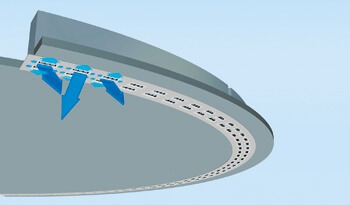 Swirl diffusers are frequently used for selective ventilation where the thermal load necessitates a high rate of air change, but importance is still attached to thermal comfort. LTG swirl diffusers, as highly inductive spot diffusers, selectively supply fresh air to both high-comfort spaces such as offices, shopping malls and restaurants and to highly sensitive working areas such as laboratories. The highly inductive and spread-out swirl flow allows high cooling loads to be reduced while maintaining a high degree of comfort in the frequented area. 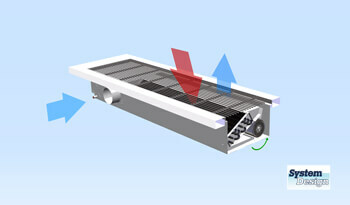 Thanks to the high induction effect of the many individual air jets, the air diffuser can be used both for very high and for low volumetric flows. The swirl disc, preset at the factory, can still be quickly and easily adjusted, even in the installed state, to changed local conditions. LTG's DLA swirl diffusers are available in many variants and can be integrated into ceiling systems or also freely suspended. 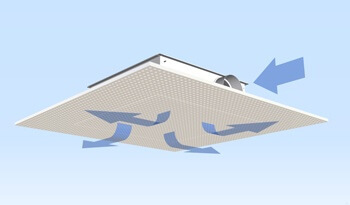 One of the latest product innovations is the ceiling air diffuser system DSA AirPanel. As the first "invisible" air diffuser ceiling element for effective ventilation and optimum comfort in rooms of all types, it consists of a Knauf acoustic ceiling including a Knauf Air Panel. 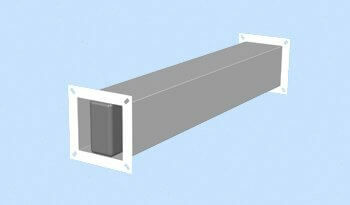 Thanks to this integration, the ventilation element is practically indiscernible except for a narrow gap. 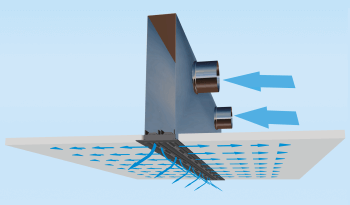 Thanks to innovative LTG flow technology, an optimum ceiling jet is achieved with an even temperature distribution, and hence a pleasant climate in the room too. The sound-absorbing effect of the acoustic ceiling is fully retained. 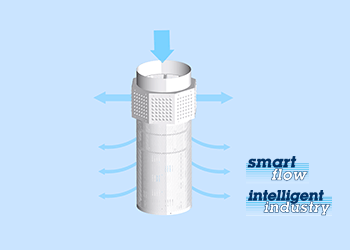 IntelligentIndustry - On-demand Ventilation with the industrial air diffuser ILQsf and other air diffusers for halls. LTG Special diffusers have been developed to meet the requirements of manufacturing industry and other special applications. 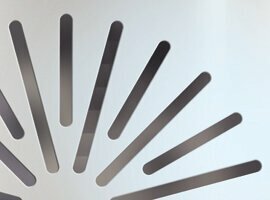 They are characterised by an especially high performance and flexibility concerning their design and positioning. Some fields of application are, for example, manufacturing industry, railway technology or rooms that require a high cooling or heating capacity, such as cinemas, theaters and concert halls, industrial or production halls or gyms. Thanks to System ActiveControl , LTG flow rate controllers handle all the important checking and control tasks, even at very low air velocities and with a minimal space requirement – and also for futuristic control concepts like demand controlled ventilation or hybrid ventilation. 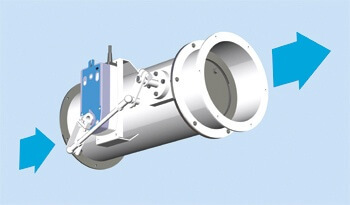 Pressure controllers are used for line pressure regulation in air pipes. 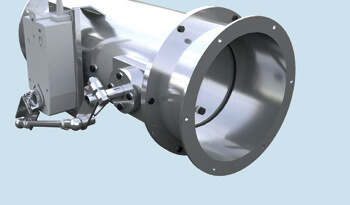 They ensure that a comparable inlet pressure applies at all connected air passages and they compensate for any pressure fluctuations – and with a sufficiently high fan pressure automatically in all lines. 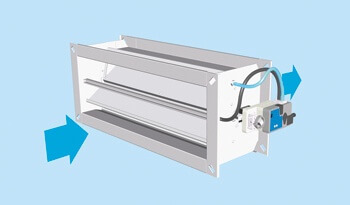 All LTG pressure controllers are also suitable for use in contaminated or chemically polluted air, and available for both round and oblong ducts. For an optimum function and adaption to special requirements, we offer several accessories for our air distribution products. The products range from silencers to reheaters. 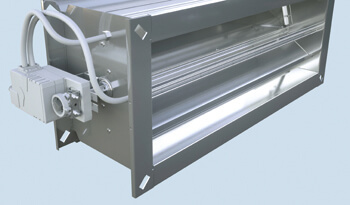 Both silencers and reheaters are available in round or square design, matching our flow rate controllers. For an optimum function and adaption to special requirements, we offer several accessories for our air distribution products. 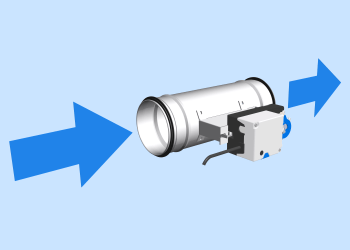 The products range from silencers to reheaters Both silencers and reheaters are available in round or square design, matching our flow rate controllers. With innovative air flows like mixed/displacement ventilation or the first demand-controlled air conditioning with induction technology - System SmartFlow -, we offer maximum comfort at an energy-efficient operation: Modern air conditioning, fulfilling tomorrow´s requirements already today. Raised demands of sustainability, economic conditions or fulfilling specifications for "Green Buildings" – there are many reasons for a better energy efficiency in air conditioning. 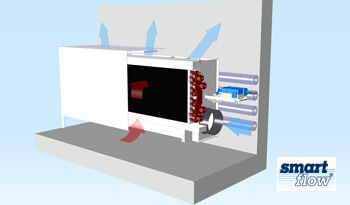 With intelligent ventilation concepts like demand-controlled ventilation, hybrid ventilation or direct induction concepts, a lot can be achieved there. 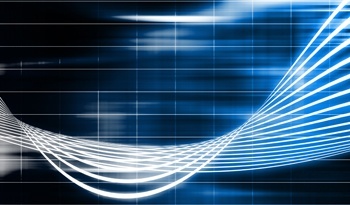 Developing air technology solutions with an optimum impact has always been our goal. That is why we do not only advance existing concepts like demand-contolled air conditioniong with induction technology (System SmartFlow) but see ourselves as a pioneer in air conditioning. However, we are not afraid of stepping on unusual paths, for example with the development of the first "breathing" facade ventilation unit with pulsating air flow FVPpulse (System PulseVentilation). Let us introduce this and other clever concepts on these sites. 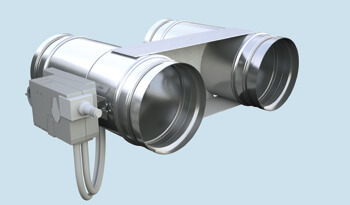 On-demand ventilation even without a bcentral building control system. 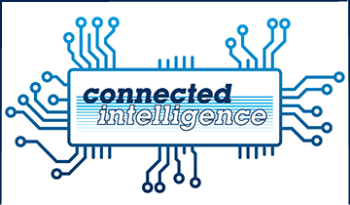 With decentralized control intelligence. 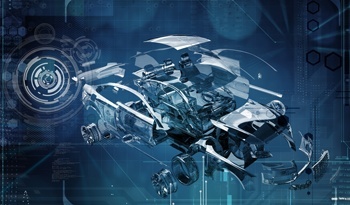 Efficient, scalable, bus-capable.